Since its inception, the HAUTLENCE brand, based in the heart of Neuchâtel, has set its sights on creating innovative watchmaking concepts and bringing them together with art, sometime contemporary or classical. Inspired by the HLQ, the HLC is a reduction of shapes to a classical execution in the perfect dimension of 41mm diameter for 9mm thick.By playing on the repetition of circles right down to the arched sections reserved for reading the minutes, the round HLC remodels its dial with the cerebral pleasure of knowing that its geometry is making an allusion to the repetitive nature of infinity.The 41 mm case has been defined based on the DNA of the HLQ, retaining the latter’s pure lines. The cylindrical form of the case, designed to optimise the opening, orientated the design towards ideas of destructured construction; thus, the four horns are screwed to the outside of the caseband, thereby optimising the adjustment of the pivoting strap to fit the wearer’s wrist as snugly as possible. Playing again with the volumes for HLC Collection, HAUTLENCE now reached a new point regarding aesthetical codes. To follow customer to be more exclusive, despite the fact that HAUTLENCE already produce each references to just 88 pieces, you will also have a choice between few colors and materials of case, dial, and straps, to customize as your own unique piece and fit to your own choice. A real watchmaking Manufacture exists primarily through its capacity to keep on producing calibres that differ from their predecessors. Attuned to its various markets, HAUTLENCE has clearly understood that it is not enough just to extend the range by regularly changing the shapes or materials used to respond to the expectations of the true enthusiast. With its 3rd calibre, HAUTLENCE seals its entry into the circle of brands that have chosen to inscribe their names in watchmaking history. By offering a third movement that has been developed and manufactured independently as part of its collection, the young Manufacture is revealing to sceptics the extent of its intention to transcend time. 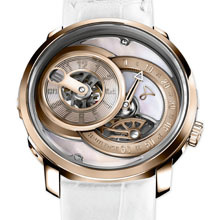 The jumping hour and retrograding minutes are still commanded by the ingenious patented HL mechanism, which combines the slide-bar’s translation, driven by the retraction of the snail’s feeler-spindle, with a gold inertia-block that acts as an inertia wheel providing the energy required to make the disc jump. 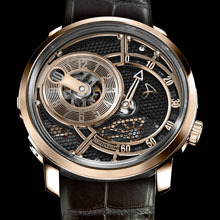 Honeycomb skeleton Black watch dial with hand applied “Moebius” sign. Intermediate dials and tracks with laser cutting minute figures, rhodium. Ardillon Buckle, white gold plate and titanium base. Honeycomb stitch watch dial with hand applied “Moebius” sign. Intermediate dials and tracks with laser cutting minute figures, galvanic Pink Gold 4N. 18K massive Pink gold for lugs, bezel and crown. Multi layer watch dial with Mother Of Pearl plate and hand applied “Moebius” sign. Minute tracks with volumic minute figures, rhodium. Case: 18K massive white gold. Minute tracks with volumic minute figures, pink gold 4N. Case: 18K massive pink gold. 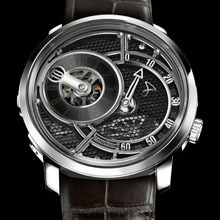 Dedicated Calibre HAUTLENCE HLC, Jumping hour, retrograde minute and running second Manual winding mechanical movement.